Blackpool Park Captains Prize winner Daniel OConnell with captain Steve Gillings. Royal Lytham and St Annes staged a highly successful Ricoh Women’s British Open, attended by a total of 62,050 over the four days. 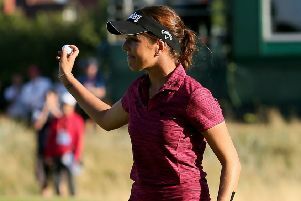 The highest single-day attendance of 16,250 was for Sunday’s finale, when the home crowds cheered England’s Georgia Hall to her first LPGA and major title with a one-stroke victory over Thailand’s Pornanong Phatlum. Hall became is the first Englishwoman to win the title since Karen Stupples in 2004 and the first British winner since Catriona Matthew, also at the world famous Fylde coast links in 2009. The 22-year-old Hall’s accuracy over the testing course was key to her success. With 167 bunkers at RL&SA, Hall ended up in just one fairway bunker and seven greenside bunkers over the course of her 72 holes. And her perfect seven-of-seven sand-saves record, including going two for two on Sunday, was instrumental in keeping Hall from dropping any shots when missing the green. “I’m so proud of the way we made tough decisions off the tee and managed to commit to the right shots,” she said. Places remain available for two tournaments at Blackpool Park Golf Club this weekend, including the prestigious Silver Niblick. The course stages its William Gladwin Memorial Trophy on Saturday an 18-hole medal with a handicap limit of 1-20 (entry £20). Sunday’s Silver Niblick is a 36-hole medal with a handicap limit of nine (£25). To reserve places (and only a few remain) contact club secretary Laura Grenall on (01253) 397916. The Captain’s Prize winner at Blackpool Park was Daniel O’Connell with a score of 140-8=132. Runner-up was Bill Phelps (149-14=135), with Alan Stone third (148-12=136). Winner O’Connell is pictured with captain Steve Gillings. The Fylde Senior League recently staged two major competitions. The Len Hall tournament was held at Lytham Green Drive. This is an individual competition, in which three players from each of the league’s 10 clubs participate in a stableford. The winner was Dennis McCulloch from Herons Reach with 37 points (acpo), with clubmate John Bostock second. The team trophy was also won by Herons Reach. 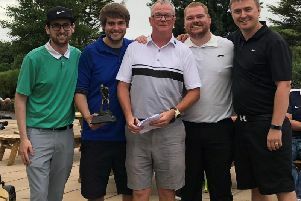 St Annes Old Links, represented by the Kilgour brothers, won the Bernard Butler Knockout Trophy for the second time, defeating Blackpool North Shore in the final. The overall winner of the men’s Riley Cup at Fairhaven was Paul Cookson. Results were as follows. Results of the Lady Captain’s fifth qualifier were as follows. Sylvia Wilson came out on top in the ladies’ Golf Foundation and an EG Medal at Knott End GC. Sylvia was the Golf Foundation winner with a score of 72 and also the silver and bronze division one winner. Kath Wright had the lowest gross with a 92. In the Bronze division two and three, Helen Tricket was the winner (74) and Jean Molloy had the lowest gross (104).